It Still Takes a Candidate serves as the only systematic, nationwide empirical account of the manner in which gender affects political ambition. Based on data from the Citizen Political Ambition Panel Study, a national survey conducted of almost 3,800 "potential candidates" in 2001 and a second survey of more than 2,000 of these same individuals in 2008, Jennifer L. Lawless and Richard L. Fox find that women, even in the highest tiers of professional accomplishment, are substantially less likely than men to demonstrate ambition to seek elective office. 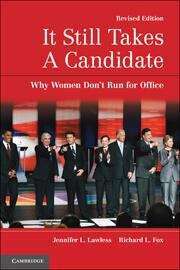 Women are less likely than men to be recruited to run for office. They are less likely than men to think they are qualified to run for office. And they are less likely than men to express a willingness to run for office in the future. This gender gap in political ambition persists across generations and over time. Despite cultural evolution and society's changing attitudes toward women in politics, running for public office remains a much less attractive and feasible endeavor for women than men.